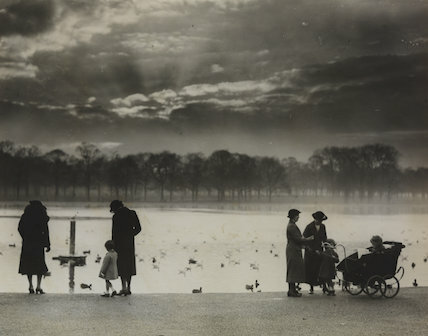 A photograph of people in Hyde Park in London enjoying the sunset across the Serpentine on a warm day in November, 1938. This photograph has been selected from the Daily Herald Archive, a collection of over three million photographs. The archive holds work of international, national and local importance by both staff and agency photographers. 'Use of the Merkhet in Ancient Egypt'. 'Grande Semaine d'Aviation de la Champagne', Reims, France, 1909. 'Whitley Bay by LNER', LNER poster, c 1930s. 'St Ives', BR poster, c 1955. 'England's First Aviation Races at Doncaster', GNR poster, 1909. Imperial Airways travel poster, 1924.